Mumbai, India – January 11, 2019: ARCON Tech Solutions has been conferred the CIO CHOICE 2019 Honour and Recognition as the most preferred brand in Governance Risk and Compliance category. This prestigious recognition was presented at the exclusive Red Carpet Night, a celebration of innovation and excellence in the ICT ecosystem, produced by CORE Media. 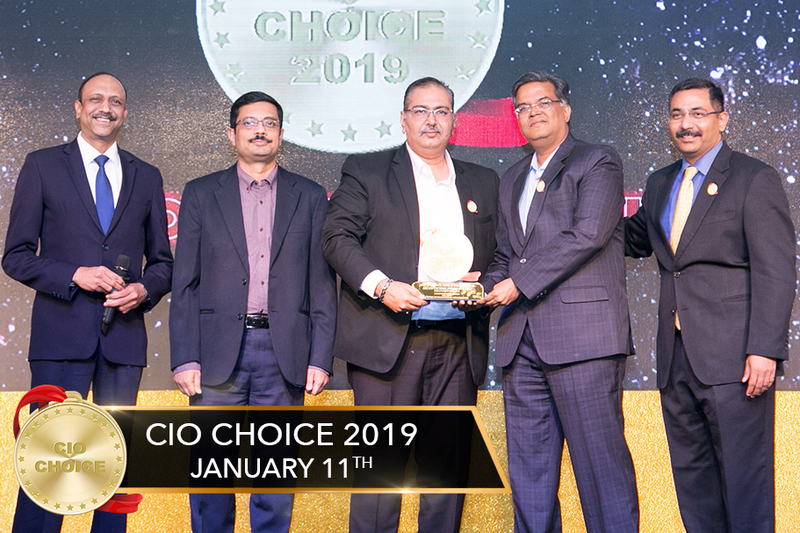 With over 300 ICT leaders in attendance, CIO CHOICE, held at The Lalit, Mumbai, was a star-studded affair with some of the country’s most high-proﬁle CIO staking to the stage to confer the recognitions and applaud the brands voted as the most trusted ICT partners. CIO CHOICE is the largest and only online voting platform, where CIOs determine and choose the products that have earned their vote of conﬁdence. When an ICT brand wins the CIO Choice recognition, it means that their product, service, or solution has been endorsed by CIOs. There is a distinguished Advisory Panel, comprising of CIOs from across verticals, that guides the entire process, with KPMG as the Knowledge Partner. ARCON is a leading technology company specializing in risk control solutions. It offers a proprietary uniﬁed governance framework, which addresses risk across various technology platforms. In the last decade ARCON has been at the forefront of innovations in risk control solutions, with its roots strongly entranced in identifying business risk across industries. Today, technology is fast evolving and the innovations are constantly challenged. Internet, millions of interconnected devices and Internet of Things (IoT) are going to change the world very soon. In this advanced arena where businesses are moving towards automation, there are greater risks evolving from the threats that are embedded with latest technology. In order to combat with the current and emerging threats, ARCON, a risk control solution provider, offers enterprise-level solutions with a sole objective of working towards the next generation in real time. The main objective of Governance Risk and Compliance category is to help enterprises implement organization policies efﬁciently to address the required regulatory compliance rules. With the considerable rise in data security threats of late, the regulatory compliance acts are getting stringent day by day. Thus organizations are now more aware and alert of the importance of data security. ARCON | PAM solution, once deployed, can create a central system that can manage business activities more effectively. It also provides a competitive advantage to understand the risks involved and enable the management to take appropriate decisions on time. ARCON Privileged Access Management solution helps in mitigating insider and advanced cyber threats by providing alerts, analytics, and monitoring of privileged users in real-time. With a host of advanced features, ARCON | PAM suite provides real-time threat alerts, analytics and monitoring that helps in preventing unauthorized access to the systems. The solution essentially provides a robust security framework while boosting operational efﬁciency. ARCON | User Behaviour Analytics (UBA) is a self-learning user behaviour analytics tool, capable to crunch a huge amount of data, spot suspicious end-user behavioral proﬁles and trigger alerts in a real time. In the age of increasing digitization, monitoring end-user behavior is highly crucial. ARCON | UBA is a powerful tool that helps in reinforcing an enterprise’s security framework. ARCON | Secure Compliance Management (SCM) is an automated vulnerability assessment tool. IT environment becomes security vulnerable if an ever increasing number of network devices , authorized end- user devices including applications and operating systems are not continuously monitored and assessed for baseline security conﬁgurations. SCM is an effective system hardening tool that enables an organization to conduct real-time assessment of baseline security conﬁguration whilst ensuring desired compliance levels. ARCON Tech Solutions Pvt. Ltd. 901, Kamla Executive Park, Near Vazir Glass factory, J.B. Nagar, Andheri (East) Mumbai – 400059.